Happy New Year! As I reflect on 2015 one word springs to mind, expansion! When I started blogging in late 2012 it served a dual purpose; a creative escape and a personal challenge to hone my first-world skills of marketing, public relations and business development on a virtual reality platform. Looking back, I can clearly see this was my inception stage for the Hidden Gems/Gloria Silverstone brand. I’ll let you in on a little secret, in 2012 I was planning on returning to grad school to pursue a MBA in marketing. However, in the back of my mind, I thought it might be a bonus if I created a business and thoroughly understood the business life cycle. So, as my blog point of view transitioned from fashion, contests and music, to interior design, I moved into the exploration stage. 2014 was filled with exciting first time adventures from new home & garden sponsors, tons of event blogging, and an interesting proposal…..to decorate a friend’s home. I finally had THE idea to form a business. In the spring of 2014, Interior & Spaces Home Design was born. The new challenge was establishing name recognition and acquiring new clients. A problem solver at heart, I quickly came up with a solution and hosted numerous open houses, showcasing different styles and started a new blog feature, The ? Room, spotlighting theme rooms based on current trends. As a Silicon Valley techie, I worked the social networks and gained followers & readers. Finally, to further position myself as an interior design blogger, I exclusively represented H&G events, discovered emerging 3-D merchants and contributed to leading Second Life publications….the evolvation stage was complete. In 2015, I vowed to cut back on blogging and focus on Interior & Spaces Design business development. And, I did. 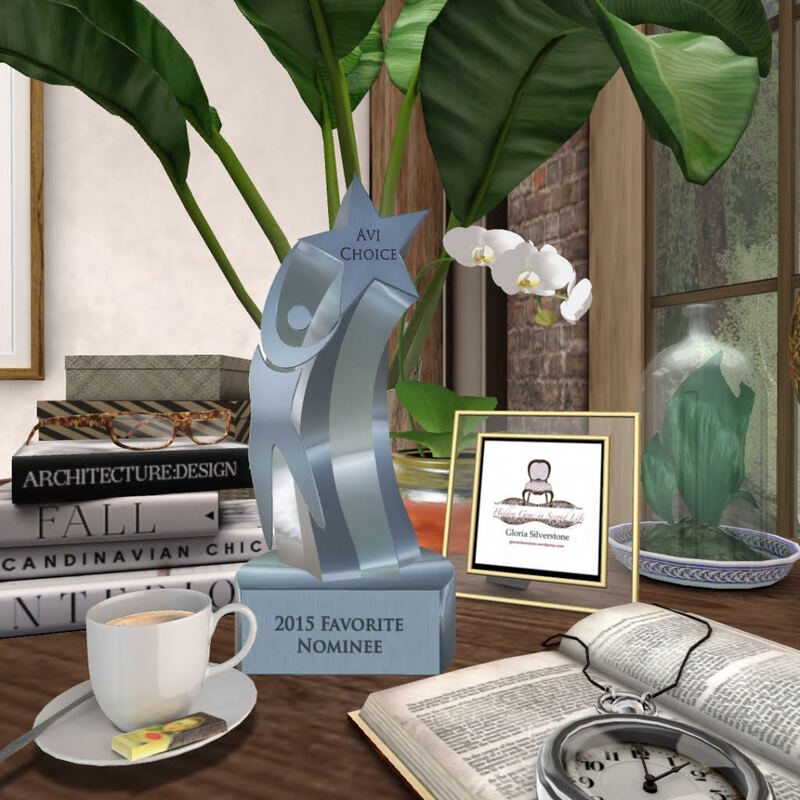 But to my great surprise, I was nominated as favorite interior designer, home and garden blogger from my peers with the highly regarded Avi Choice Awards. Establishing name & brand recognition check! Soon after the nomination, I was asked to guest blog for first-world design companies, further leading to brand development. Expansion into the commercial sector was next on my list and fortunately my company, Interiors & Spaces, was hired to design My Light Fashion Agency (& in late December BOSL). As the summer rolled around, I was itching for water and rented a beach parcel. Memories of past travels and dreams of future adventures led to my only open house of 2015 featuring three beach shacks, all designed in different themes and one large Bali Ha’i getaway. (Note to self, host more house tours this year). The later half of 2015 was filled with charity event blogging for notable organizations (American Cancer Society, American Diabetes Association, National Breast Cancer Foundation, and World Food Program) and this is truly one of my favorite parts of the VR gaming community, to come together and support each other. With a career background ranging from corporate to community event planning, I’m pleased when I can utilized my professional experience for a good cause. As 2015 has come to a close, I’m proud of my business growth, the partnerships I’ve made, and my entrepreneurial spirit! In 2016, I look forward to thriving business opportunities, steering a flourishing company to greater success and exciting innovative technology to make VR a more immersive experience. 3). Interior & Spaces Styles BOSL! 5). Act today to change tomorrow!